Join the Berwick Garden Club to brighten up our community and increase food availability and awareness for our residents! 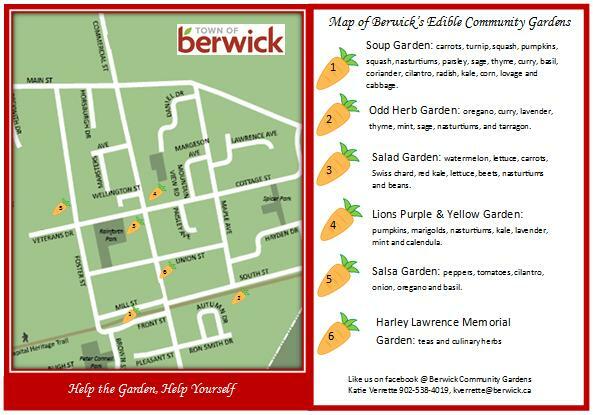 During the Spring of 2015 the Garden Club planted several edible gardens around the Town of Berwick. Each garden is named after its content and contains the necessary ingredients to create something delicious! Gardens on the map include the Soup Garden, Salad Garden, Salsa Garden, Odd Herb Garden, Lion's Purple and Yellow Garden, and the Harley Lawrence Memorial Garden. Residents are encouraged to visit the planters and help themselves to the wonderful treats, or harvest and bring for those in need. Garden maps can be found at the Town Hall, on our website and Facebook. Join our Facebook group, Berwick Community Gardens, to stay in tune with local garden events or to join the club! No gardening experience necessary, all are welcome!